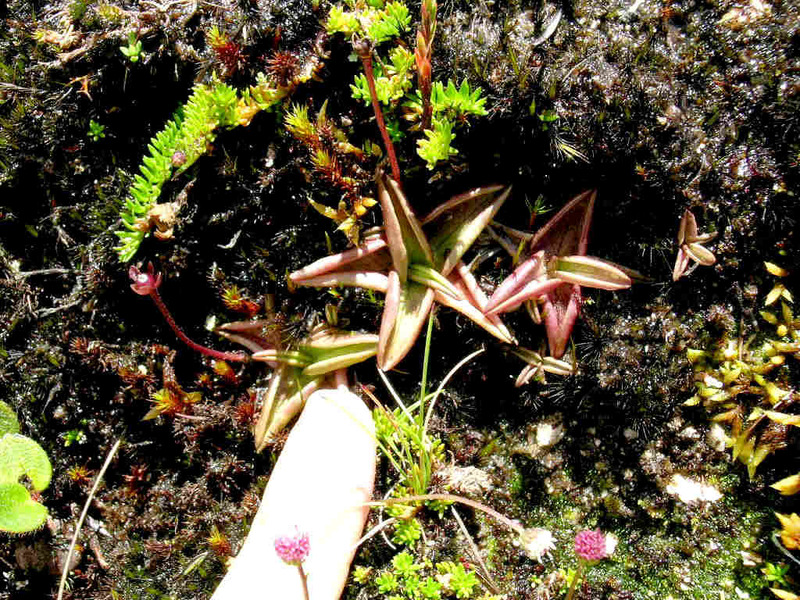 Carnivorous plants on the Inca Trail. In late January I went for work to Peru ,a country I'd never visited before. I'd long been waiting for this opportunity, since I wanted to do a little tourism in this country. 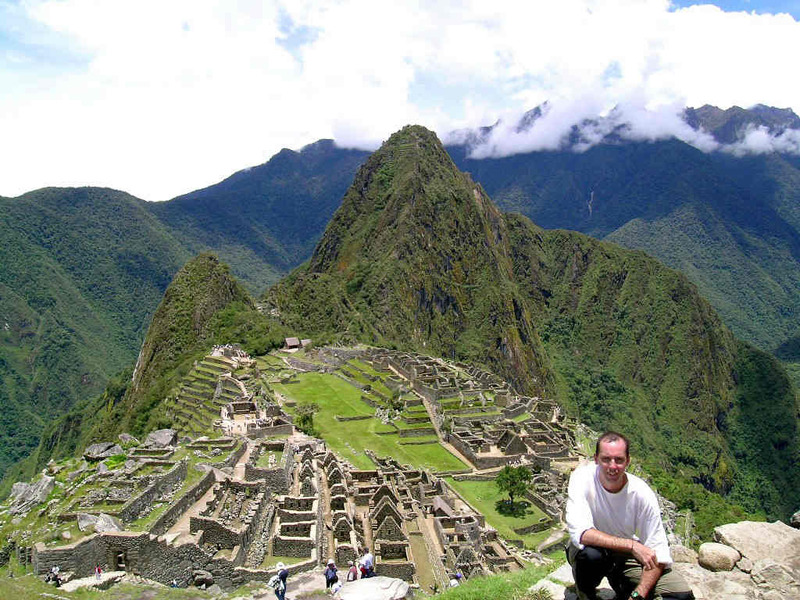 Obviously, I wanted to visit Machu Picchu, the famous lost city of the Incas. 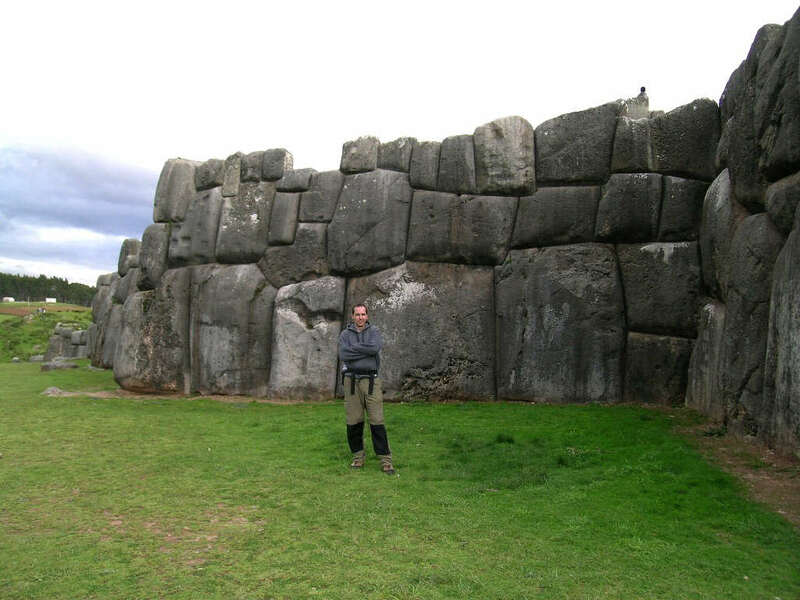 But I didn't want to go to Machu Picchu like most tourist do, by train and bus on a day tour from the town of Cusco. I wanted to trek the Inca Trail of course! 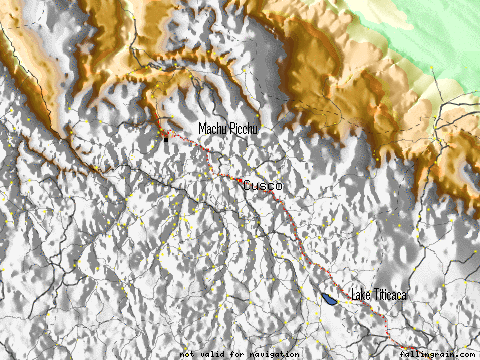 The 4-day / 3-night Inca Trail starts off at ~2600m altitude and ends in Machu Picchu at ~2400m altitude. But along the way the trail climbs over 3 mountain passes, respectively around 4200m, 3900m, and 3700m altitude, descending quite a bit between each pass -- sort of like an extended roller-coaster ride. And one that literally takes your breath away because of the high altitudes. I spent 2 weeks in total travelling around southern Peru, starting with a week in the Cusco area, then 2 days in the port town of Puno on Lake Titicaca, then 3 days in Arequipa and nearby Colca Canyon, then a day to visit the famous Nazca Lines near the coast, ending up with a day tour of the Ballestas Islands and Paracas Penninsula where we saw tons of sea birds, penguins, sea lions, and even flamingoes. In and around Cusco there are lots of cool Inca ruins and colonial churches and I could easily have spent another week in this pleasant town. Flying from Lima to Cusco, initially I had a hard time believing there could be any CPs at all, since it was incredibly dry on the western side of the Andes, facing the Pacific Ocean. But as the plane crossed over the Andes on a SE-heading route, it became increasingly humid and I realized that the eastern Andes (facing the Amazon) were probably where all the CPs were found in Peru and maybe other nearby countries. This observation increased my hopes of seeing CPs on the Inca Trail. Although CPs really weren't in my plans for those hollidays, of course I wouldn't be sad if I found any. I had no location data for CPs in Peru, all I knew was that there was one Pinguicula species (P.involuta), one Drosera (D.peruensis, described only last year), and epiphytic Utrics (U.jamesoniana and maybe others?). Visiting the Sacred Valley and other beautiful areas around Cusco, I observed that the vegetation was mostly alpine higher up and somewhat xerophytic further down. 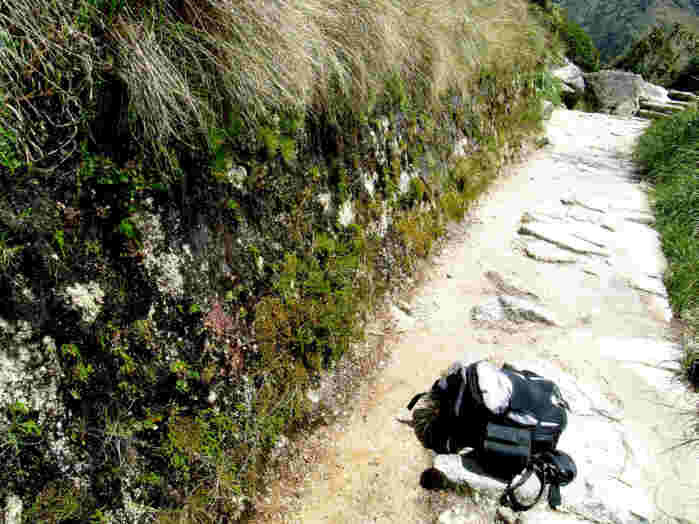 Hiking the Inca trail, this is what I saw on the first 2 days as well, except for a short stretch of cloud forest. This was at the steepest part of the trail, which gave me plenty of opportunity to look around and examine the moss-covered branches of the trees for Utrics, while stopping to catch my breath. Couldn't find any. 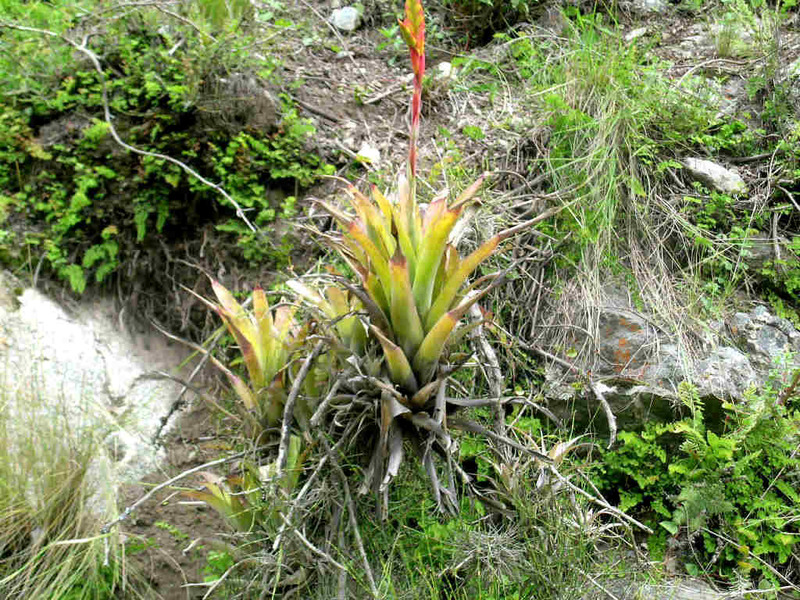 Actually, I wasn't sure but I'd possibly already found a CP earlier on the Inca Trail as well as near the ruins of Pisac in the Sacred Valley, where I saw colonies of a yellowish bromeliad growing on rocks which looked very much like Catopsis. But being no bromeliad specialist, I can't be sure. If anybody can tell from the pics, please write me. 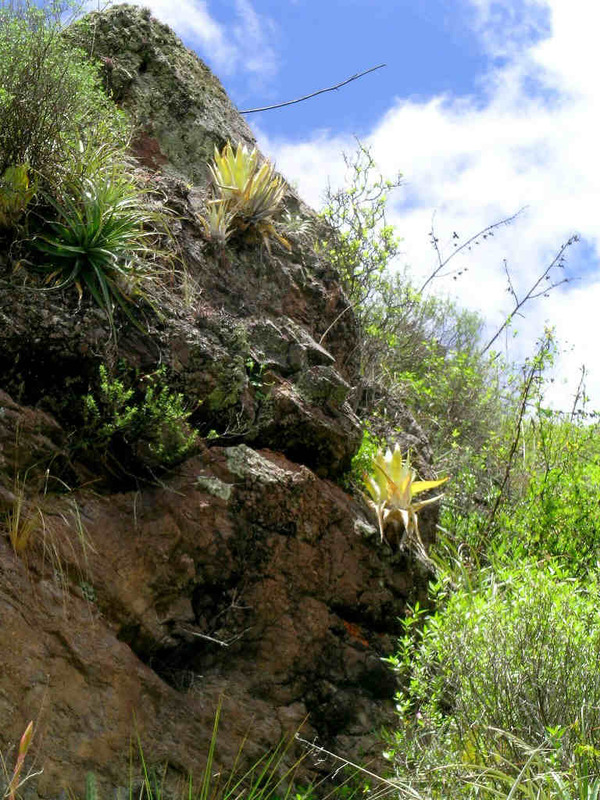 Colonies of a yellowish bromeliad growing on rocks which looked very much like Catopsis. Yellowish bromeliad growing on rocks. Close-up of the yellowish bromeliad flowering. In a way the Inca Trail spoiled me forever. I'll never be able to camp again, or at least it will be much more miserable in the future. You see, to hike the Inca Trail you buy into a package tour where porters not only carry the tents and all the food, but also put up the tents at camp, take them down in the morning, prepare all the meals (including popcorn for "tea time" late in the afternoon and waking you up with hot coca leaf tea at your tent in the morning), and clean all the dishes too. It was fantastic! And to make things even easier, together with the 2 friends I was travelling with, we hired a personal porter to carry our sleeping bags, clothes, and other items, which meant we were hiking very light, carrying only a small backpack with camera, water, a few munchies, etc. It was nonetheless a very tiring hike, but not having too much weight on my back allowed me more time and freedom to take pictures, enjoy the fantastic views, as and explore for CPs. Also, having spent the previous few months in Mexico City, at over 2200m altitude, probably helped prepare my body a bit better for the altitudes encountered on the Inca Trail. 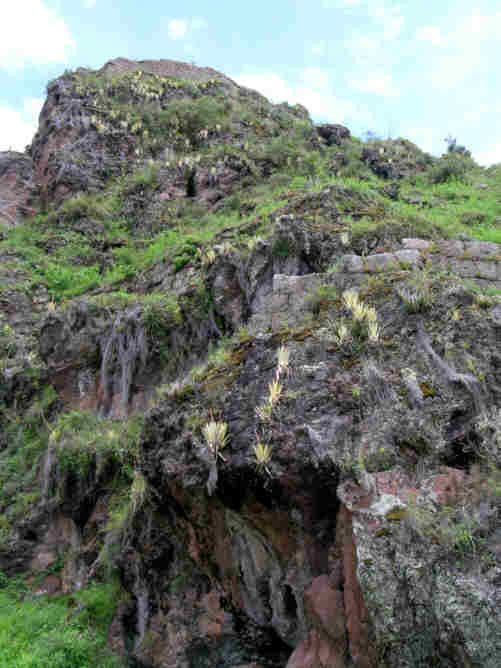 January-February are the peak of the wet season in the Cusco area, which means it's also the low tourist season. The dry season is around June to September, and at this time of year Machu Picchu supposedly becomes a human anthill while the limit of 500 people per day on the Inca Trail is a a reality which throws the prices for this tour way high. Nonetheless, there were numerous tourists on the trail and I noticed that at each of the camp sites had around 10 groups of ~25 people each (between tourist and porters/ guides). Fortunately, we lucked out on the weather. It only rained during the nights, stopping punctually at 6am every day. Although usually foggy in the mornings and partially cloudy during the days, it was mostly sunny and the views of deep valleys and snow-covered peaks were constantly all around us. It would've been a very cold and miserable 4-day hike if it had been raining, and I can't imagine trekking all those days and missing all the wonderful views. Inca Ruins with the Machu Pucchu and Fernando posing after his long trek. Luck was even more on my side on the 3rd day of the Inca Trail. As we climbed to the 2nd high pass (3900m), Sphagnum moss all of a sudden became very abundant all around. It looked very propitious for CPs, especially around a small pond. But... nothing. It continued more or less like this as we descended from the pass down to nearly 3000m past small Inca ruins, until the trail crossed a magnificent cloud forest. 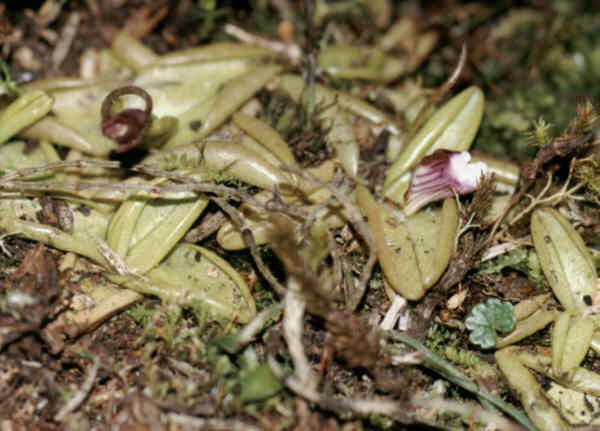 It was all perfect for epiphytic Utrics, and yet once again... nothing. Lunch over, we began climbing to the last of the highland passes, along a mostly W-facing mountainside up to around 3700m altitude. Once again Sphagnum was suddenly all over the trailsides. The whole mountainside was a huge seepage with mucky black soil, reminding me very much of Neblina or some other peak in Brazil. I kept expecting to see Drosera graminifolia, Utricularia reniformis, Genlisea violacea, or Heliamphora minor at any moment. In fact I was getting increasingly frustrated as I hiked up the trail. It was just soooooo perfect for CPs!! They had to be there somewhere! 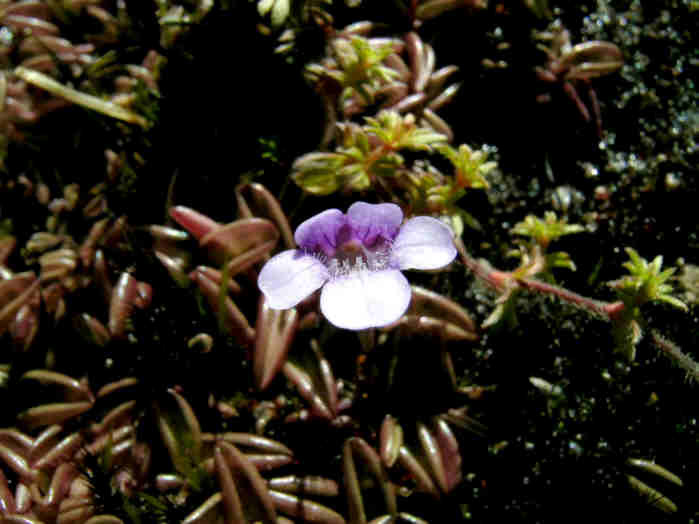 At around 2600m altitude, I spotted a small purplish flower on vertical banks by the trail. Bending over for a closer look, I realized there were dozens of tiny rosettes surrounding that flower. It was a Pinguicula, HA! Honestly, of all CPs the ones I was least expecting to see were Pings -- probably very rare and the last I'd ever run into. And yet, secretly, Pings were the CPs I most wished to see in Peru... I guess the past few months in Mexico have skewed my priorities! 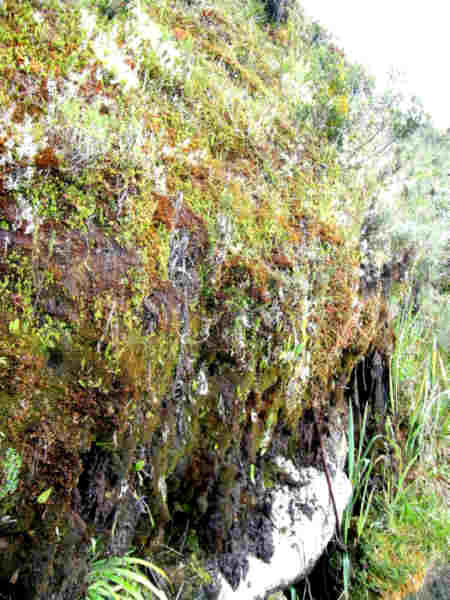 The habitat of Pinguicula involuta, a cliff with mosses. 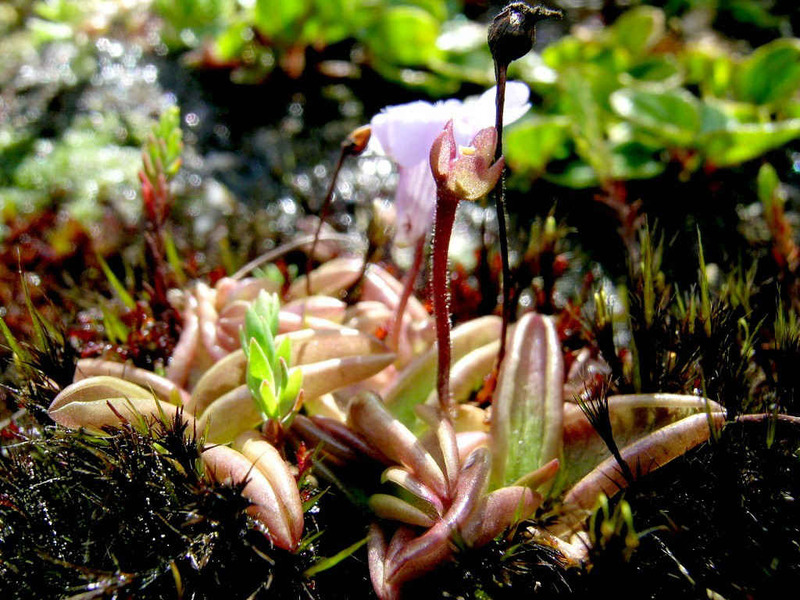 Impressive cluster of Pinguicula involuta. 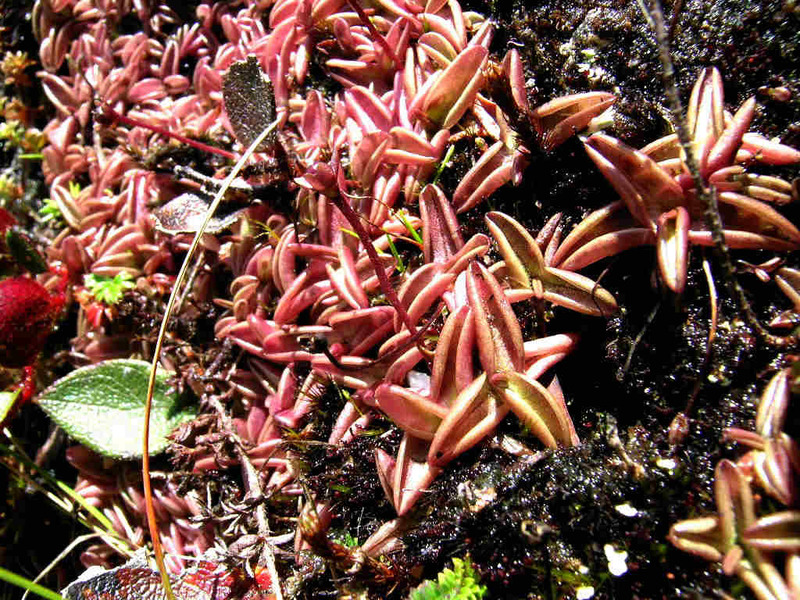 Impressive cluster of Pinguicula involuta, note the red coloration of the rosettes. The red coloration can be a result of a high sun exposure. 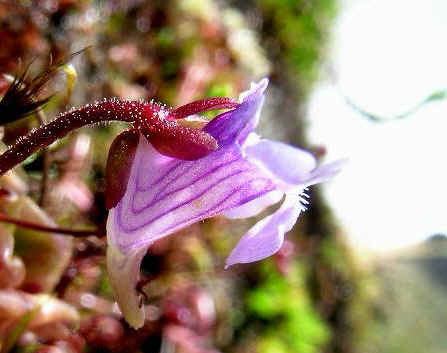 The flower of Pinguicula involuta. 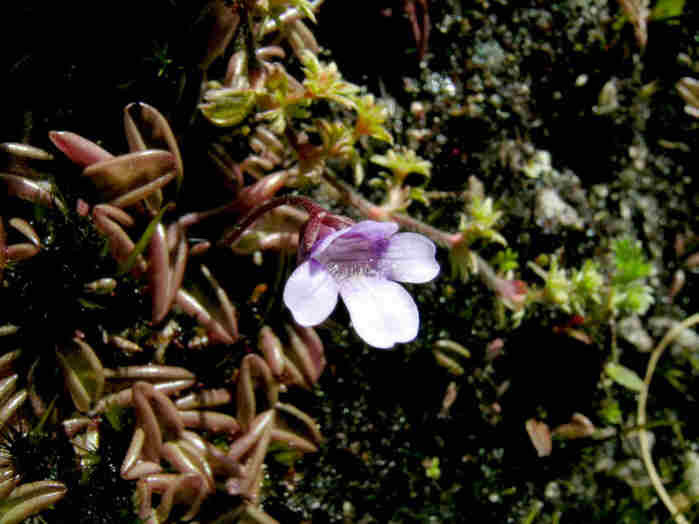 Close-up of the flower of Pinguicula involuta. 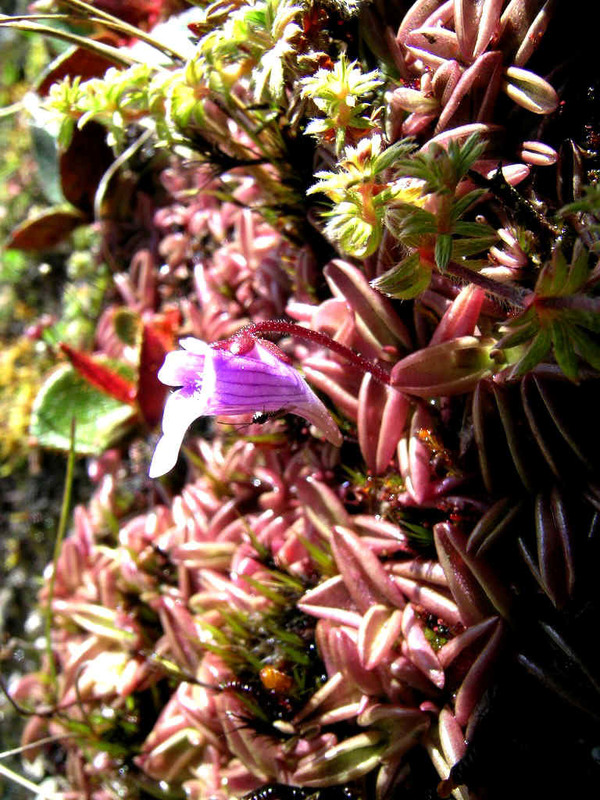 Pinguicula involuta not far the 4-day Inca trail in Perou. Note the angle between the spur and the corolla and the veination of the gorge. 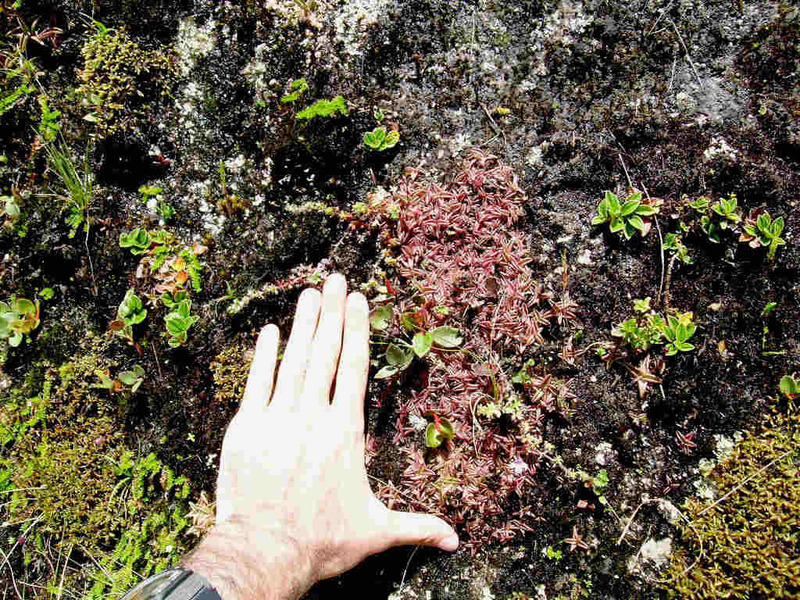 Note the red scape and red calyx of Pinguicula involuta. A mature seeds cap and a flower on Pinguicula involuta rosette. Pinguicula involuta exhibiting various red colourations on the rosette. Close-up of two flowers showing two different coloured spurs. 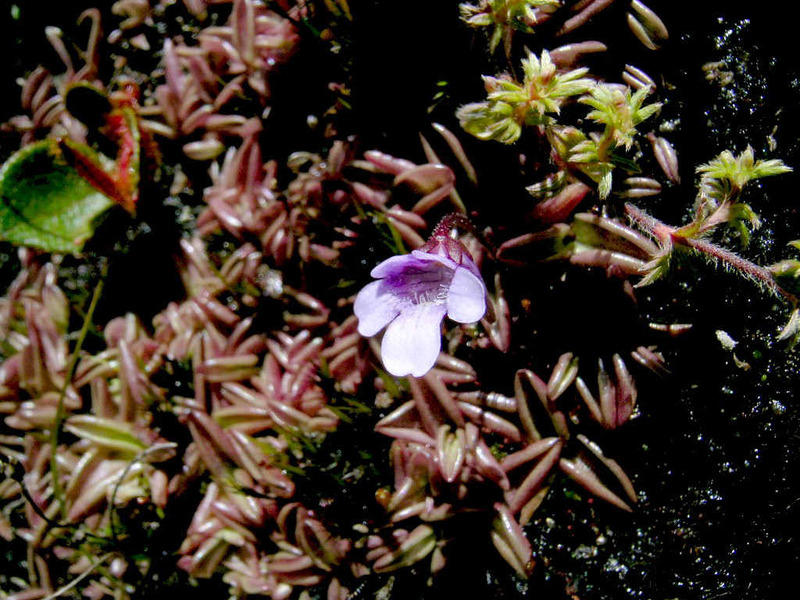 Pinguicula involuta growing among mosses. So in a rather open and sunny part of the trail, packed together in a small area, there was a huge number of Ping rosettes, lots of flower scapes with fruit, and 2 open flowers. Further along the trail I found 2 more spots with fewer rosettes and one open flower in a somewhat shady location. I'm sure there must've been more, but those small rosettes are probably easily overlooked when flowerless. The rosettes reminded me of small P.planifolia, around 1-4cm in diameter. Strangely, I remember them being a greyish green-blue color in the wild, and yet in my pictures they appear pinkish. 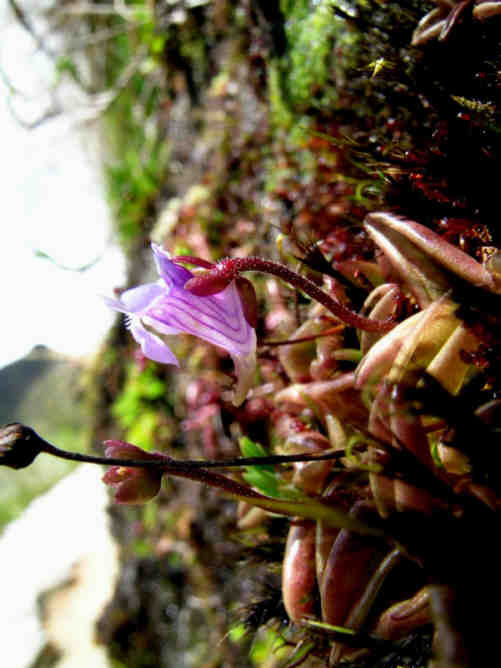 The entire flower scapes, including sepals and fruit were a deep red color and reached only 1-4cm in length. Curiously, the 3 sepals above the fruit were very narrow while the bottom 2 were wider and fused together almost to the tip. 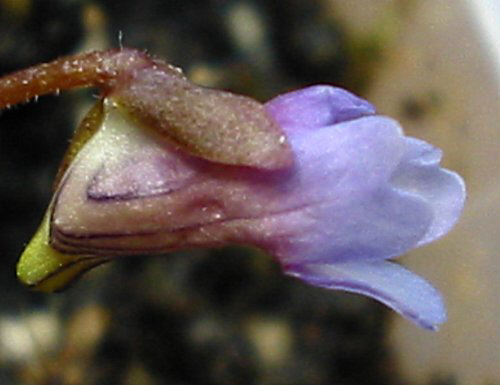 The flowers were a light purplish-blue, maybe lilac, with darker purple parallel veins along the length of the tube, in total only slightly over 1cm in length. 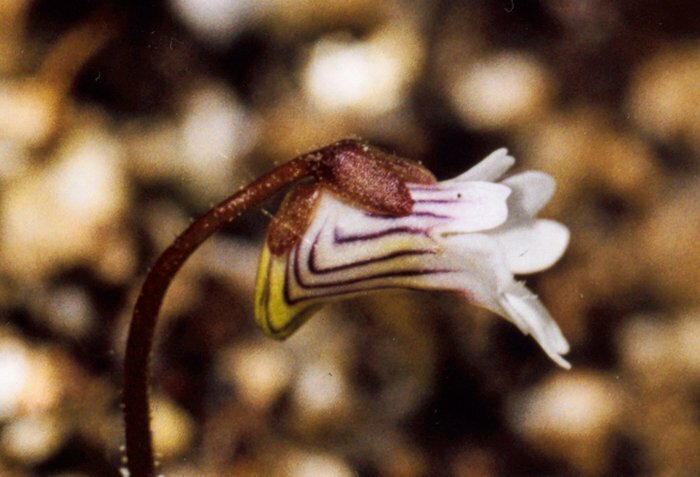 The short stubby spur varied between a dark reddish purple to yellowish white color. 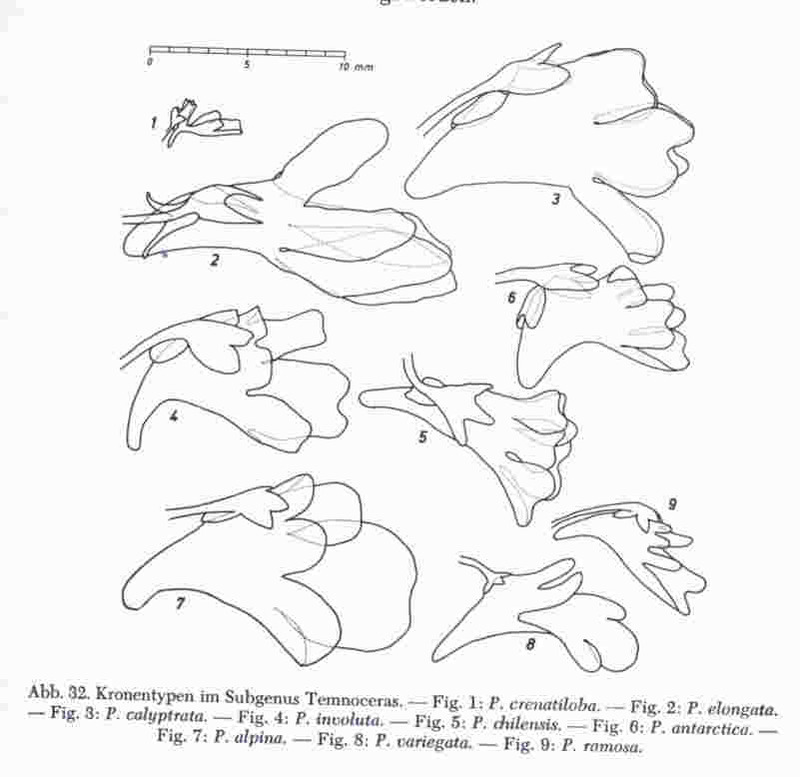 The upper 2 corolla lobes were shorter than the lower 3 lobes, and all 5 were slightly notched at the center. The internal walls of the 3 lower lobes were covered with numerous long white hairs at the entrance to the corolla tube. In one older flower, I noticed that the 3 lower lobes of the corolla were bent down and backwards. 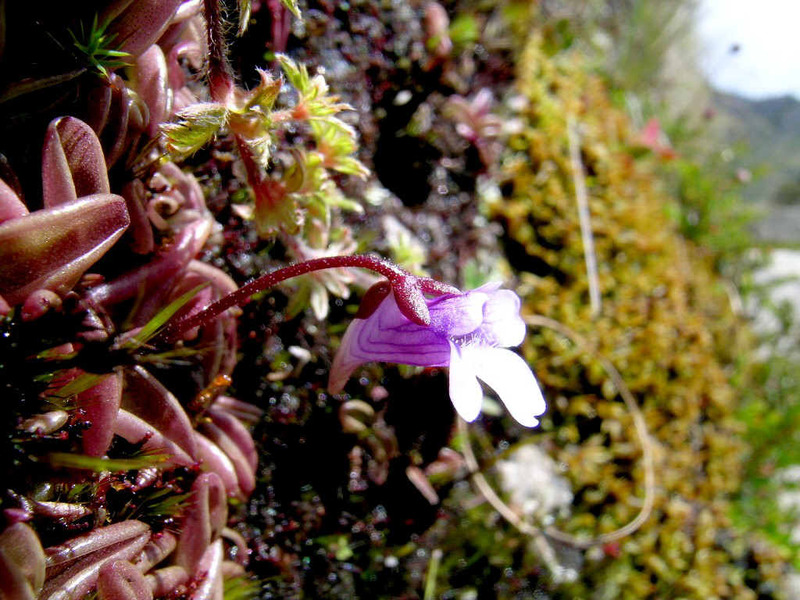 So what species of Pinguicula was it? 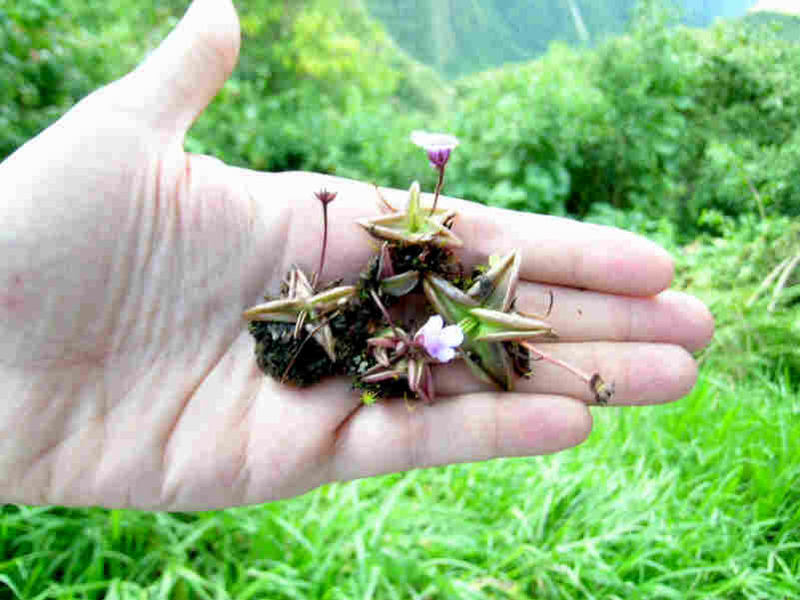 When I found the plants, I couldn't remember the names of all the S.American species off the top of my head. The 1st name that came to mind was P.calyptrata. 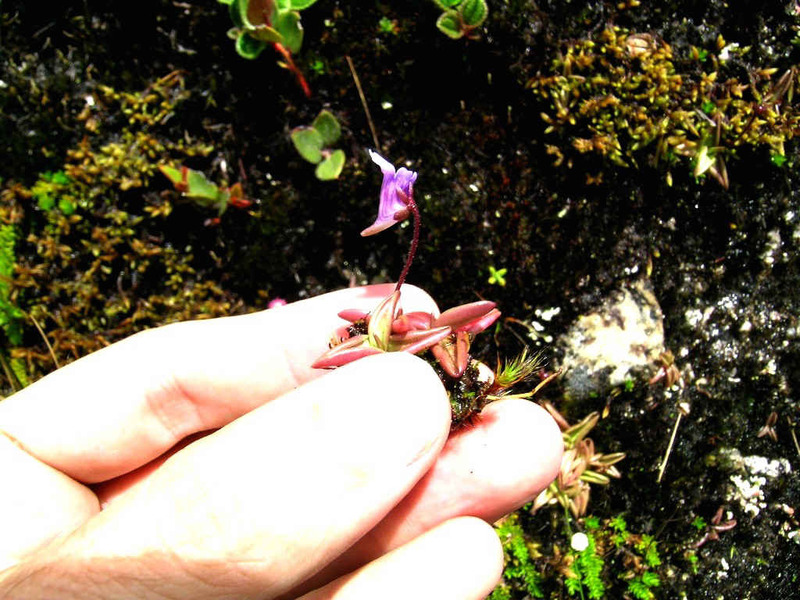 Not only did I remember that they were from either Peru, Ecuador, and/or Colombia, but on Eric Partrat's webpage the pics showed a similar plant with purplish-blue flowers. So I simply decided to call it P.calyptrata in my field notes, but throughout the trip kept trying to remember the other S.American species and what they looked like. 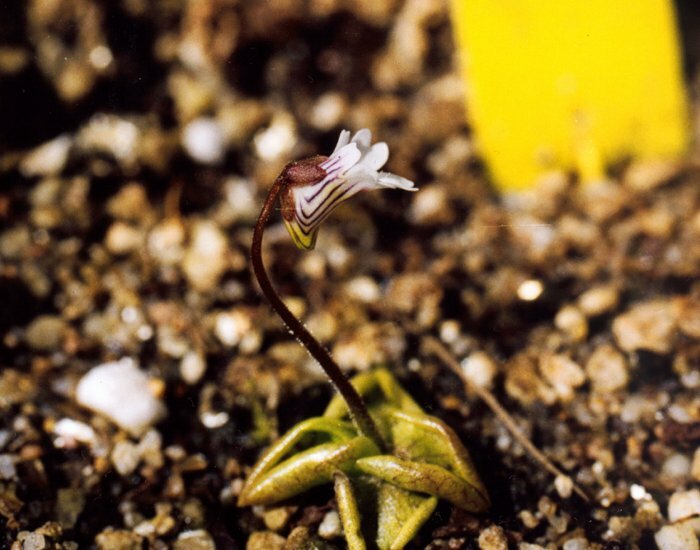 I remembered there was a P.elongata from Colombia and Venezuela, with long linear leaves. Nope, definitely not it. 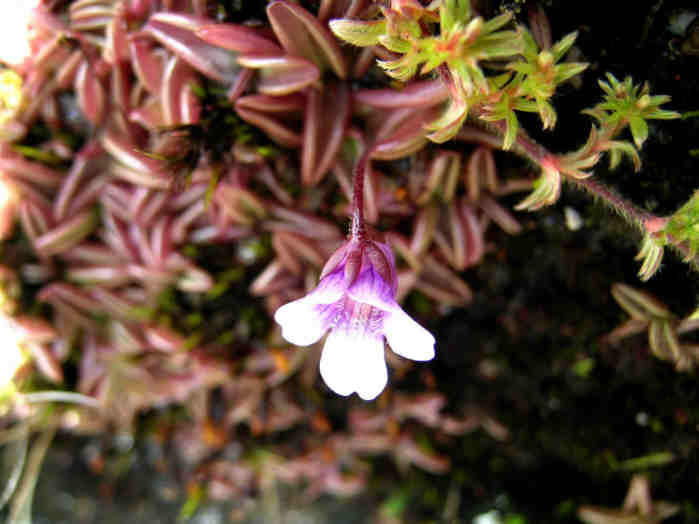 I also remembered a P.antarctica from Chile and Argentina, but the pics I had in my mind were of a light-colored flower with a short fat spur. Hmmm, probably not it either. Then there was P.chilensis, but I had no idea what it looked like nor what its geographical range was. Could my plant be this species? I thought I remembered that P.chilensis was only known from Chile and Argentina, but that doesn't mean it doesn't grow in Peru, maybe it just hadn't been found there yet. And then there was.... what was it called? I knew there was a 5th species in S.America, also from the same general geographical area as P.calyptrata, but I couldn't remember its name, although I kept thinking about it throughout the rest of my Peruvian hollidays. 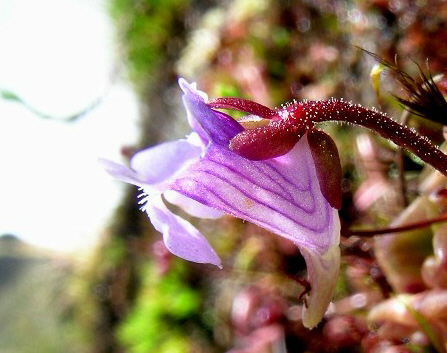 Back in Mexico, looking at Jan's Database I saw that it was called P.involuta, known only from Peru and Bolivia, and that P.calyptrata was only known from Ecuador and Colombia. Could my plants be P.involuta then? 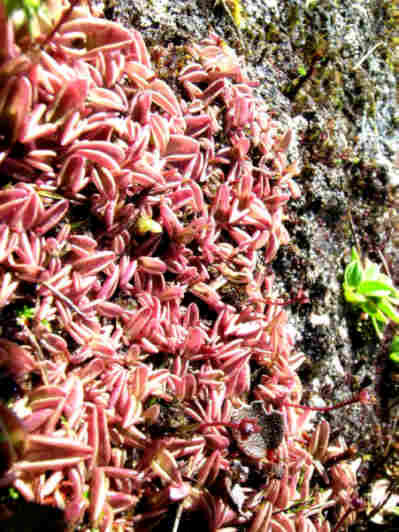 Or maybe I'd discovered an extension of the known geographical range of P.chilensis or P.calyptrata? 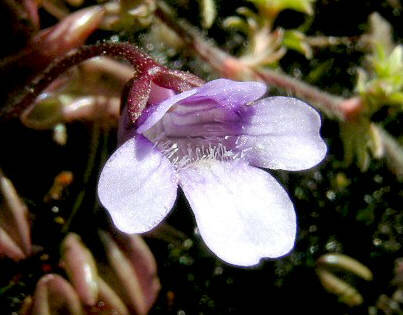 To make things worse, I had no idea what P.involuta and P.chilensis looked like. To help solve the mystery, Eric sent me flower drawings of S.American Pings from Casper. P.chilensis was shown with a spur sticking straight out and corolla lobes of equal size while P.calyptrata had a short fat spur similar to that of P.antarctica. Thus Eric and I agreed that what I'd found was truly P.involuta. Photo : Botanical Garden of Nitra. 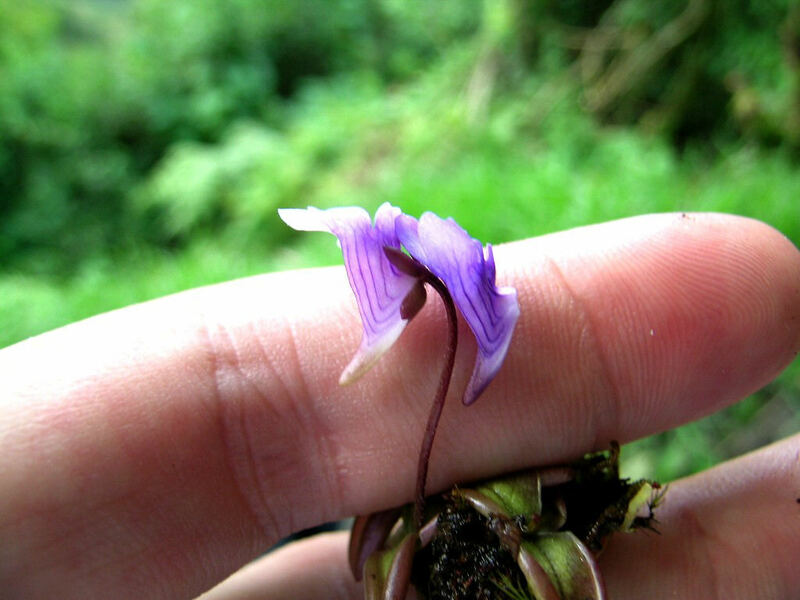 Inadvertently, by going to Machu Picchu in the summer wet season, I risked missing the spectacular views, but was rewarded with flowering P.involuta. If I had gone in the winter dry season, who knows if I would've seen anything at all? Judging by the short stiff stems below ground and the well-developed roots, I don't believe P.involuta is annual, but I can't say if it goes dormant or not in the winter. Although found growing along a very touristy route, surprisingly I believe these may be the 1st widely available pics of P.involuta.